Former North Lanarkshire provost Barry McCulloch is out of politics for the first time in 30 after losing his Cumbernauld North seat. 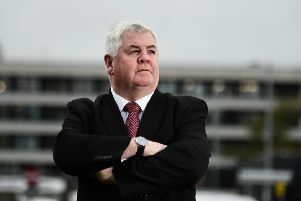 A former member of Strathclyde Regional Council the Labour stalwart joined North Lanarkshire Council following reorganisation in 1996 and was most recently convener of housing and social work and chairman of North Lanarkshire Leisure. Mr McCulloch wasn’t the only casualty in the ward as independent Alan O’Brien also lost his seat and with Labour’s Bob Chadha having retired it means the SNP’s Alan Masterton was the only sitting councillor to remain. Cumbernauld North will be represented by newcomers Junaid Ashraf (SNP), Calum Currie (Conservative) and Tom Fisher (Labour). Mr McCulloch said: “It’s been a great election, I want to congratulate the SNP for running a very fair campaign and of course my winning Labour colleague Tom Fisher. “He worked really hard and we did well with the vote, it is just disappointing it wasn’t enough to get us both elected. “I’ve thoroughly enjoyed representing the people of Cumbernauld for the past 30 years, but it’s time to hand over to younger people.